I’ve been fortunate to work with a variety of great companies with unique products. Today’s review on the UGLee pen may stray away from my usual baby-related posts, but it fits right in with my other one of my other interests: education. Although I’m planning on staying home while Baby J (and hopefully our additional children) are young, I do eventually want to return to the classroom. I love teaching, but the grading is far from fun. Assigning essays is always the biggest nightmare, because it means I have more than 100 essays to read, review, and write suggestions for- rough drafts, second drafts, and finals. Frequently, I would have hand, wrist, and lower arm pain (repetitive stress injury?) from the hours spent holding pens on a daily basis. When I read that the UGLee pen is ergonomically designed to be extremely comfortable, I was curious to see how it would work. 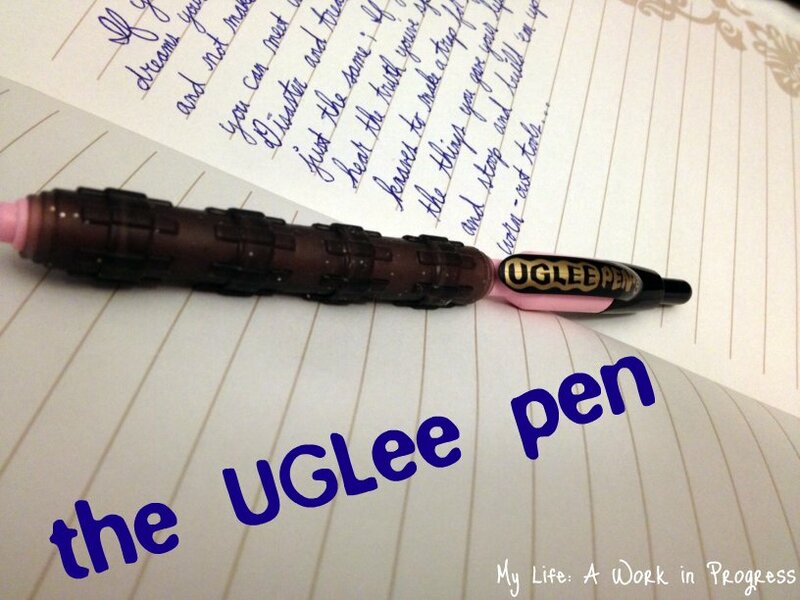 UGLee is a combination of the words “ultimate grip” and the pen’s creator. Dr. Lee would often write 20 pages of notes a day while studying at the Stanford University School of Medicine. Frustrated with uncomfortable pens, he set about creating a truly comfortable pen. Lee x-rayed his own hand to come up with a pen design that was aligned to hand bones and ligaments. Weighing only 11 grams, the UGLee Pen is made with ballistics-grade nylon, and the ink is a cross between gel and ball point pen ink, so it’s smooth and long-lasting. I received a three-pack of pink UGLee pens. The pens also come in red, white, yellow, green, blue, and silver. They all have black ink when first purchased, but ink refills in blue and red are also available. It took a little while for me to get used to how this pen feels in my hand. It feels squishy and almost “sticks” to my hand without actually being sticky. It actually reminds me of the fishing lures I used as a kid. I rolled the pen around the carpet just to see, but no fibers stuck to it, so that was good. I conducted a test by writing the first two stanzas of a poem with the UGLee pen. Then I grabbed a plain old standard ink pen and did the same. The UGLee pen was more comfortable to write with. I also had a more secure grip on the pen. With the standard ink pen, I have to pause at the beginning of every line to readjust the pen, since it’s rolled a little bit on my fingers. I didn’t have this problem with the UGLee pen. After writing with the UGLee pen, my fingers felt great, but I still felt strained in my wrist. However, I think it’s important to note that I don’t hold a pen or pencil correctly. (This is probably why my handwriting is atrocious.) I scrunch my hand down toward my fingers, and it’s a very strained, clenched position, but I’ve been doing it for 25+ years, so I’m used to it. Also, the pen really is lighter than other pens! I tried lifting several pens one by one, and the UGLee pen felt the lightest. Unfortunately, I wasn’t a fan of the ink. After writing a few pages in my journal, it started to look like it was running out. I opened the pen and looked at the tube though, and the ink looked almost full. :/ Overall, I would agree that the UGLee Pen is more comfortable to write with than a standard ink pen. Currently, a pack of three UGLee pens is on sale on their site for $19.99, or buy them from the Writing Pen Store. You can also purchase an individual pen for $4.52 as an (affiliate link>>) Amazon add-on item. Want to learn more? Visit the UGLee Pen on the web. Stay up to date with deals and news- follow UGLee Pen on Twitter and Facebook. Note: I received one or more of the products mentioned above for free using Tomoson.com. Regardless, I only recommend products or services I use personally and believe will be good for my readers. Affiliate link present. If you purchase through my link, I will receive a tiny, tiny commission that I will use to buy e-books or baby products to feed my shopping addictions. The ink thing would annoy me, since I write a lot! Another thing I’d like to see is pens were you could replace the ink… seems so wasteful to me to always throw it out! But I do like that its meant to be more comfortable, my hand tends to cramp up when using a regular pen after writing a full page of a letter! Thanks for commenting! You can, actually replace the ink. There are several ink color choices for the UGLee pen! I’d like to have my high school son try it. He hates writing because of the hand cramps! I”m just curious. Are you left or right handed. The ink gave me a hard time when I was reviewing this pen as well. I often have issues with gel-type pens. It seemed like I had to scribble a bit to get it going each time I wrote. Also, if this is your handwriting photographed, I think it’s great! Better than mine! Another wonderful review with your honest and insightful opinions. This looks like a product I would like to check out! I am a full-time student and could definitely see myself using this a lot! I hate getting cramps and such from writing so much. Although the pen looks weird, it looks oddly comfortable! I’m a lot like you. I put a death grip on the bottom of the pen with my fingers all squished up! After many hours of writing, I always end up with hand cramps! I’ll have to try one of these!